Solved How to convert perspective to dashboard? If I convert a dashboard to a perspective, is there a way to turn it back to a dashboard later on? I’m slowly moving all my dashboards to perspectives, as it’s a nicer experience for users to have a unified place for monitoring objects. I’m not entirely sure if I’m going to hit a point where I go “oops, I should have left it as a dashboard”. Unlikely, but thought I’d pose the question. Is it as easy as moving the jspon from the Perspectives folder to the dashboards folder? Or something more complex? The json for a dashboard vs perspective is subtly different so moving the files will not achieve your requirements. What you can do, however, is publish perspectives to the navigation bar, which is like making them into a dashboard. If I do that, does that mean it's still linked to the object? Dashboards are not linked to objects, so publishing the perspective to the nav bar will still be linked? It will still be linked to the object and you will still be able to see it when searching for the object it's linked to. You will only need to edit one item. So if the object got deleted, would i lose the perspective? Good question. I think the perspective would remain, but as there would be no object for it to display on, only the dashboard could be found. Opening it would likely cause an error, as it's target object would not exist. It's possible this could just be a "object does not exist" type error, though it's also possible this might crash the application. I've not had an example of this, so I'm not sure! This one is probably a question for support. But one other option is to clone the dashboard before you convert it to a perspective. Then you will have to old view as well. I have used that option in some cases when I want to keep users from modifying my “template”. Cloning is an idea, but it does mean two places to maintain a dashboard. I update perspectives quite often, depending on what engineers want. I may have to do some experiments. Why not clone it, convert the clone to a perspective, then archive the original dashboard .json file off somewhere else? Then if you do need to restore it later, you can. Although it won't have any changes you've made in between, it may be easy enough to recreate those prior to removing the perspective. 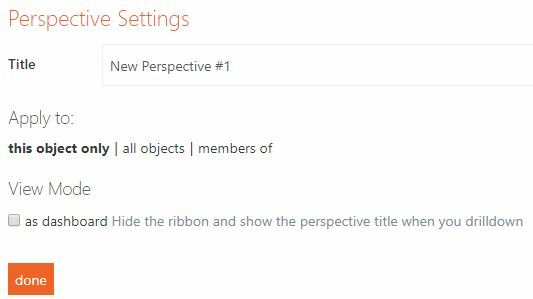 Also once you start using relative scopes in your perspective tiles, it may become difficult to convert it back into a dashboard, as you'll either need to start playing with advanced criteria or creating custom groups just to enable the same scope. The only issue I foresee with Vypers option is that you'll have to admin two pages if anything needs to be updated. I need to give it some thought I think how I'm setting up my dashboards. I like perspectives as they give a 'tabbed' view. But dashboards are more flexible as they are not tied to an object. Currently I have to create DA's for my perspectives to simulate a 'tabbed' dashboard experience. It's a bit of a pain. It's like there needs to be a hybrid dashboard-perspective option. Indeed, it's a little cumbersome, but the experience a lot better compared to v2. Creating DA's for your apps isn't a bad thing, though you can achieve a similar goal with a group. It's just that a DA is a better representation of an application. Agreed it's much better than v2. I'm thinking I might move to using groups, rather than DA's to link all my perspectives to. Currently if I create a status tile showing groups, I can't click through to the 'unified' dashboard since it's linked to a DA. And we group all our servers and have a big dashboard showing groups of objects relating to each application. I guess now I need to figure out how to move all the perspectives that are linked to a DA, over to a group. Sounds like you've got your work cut out 😉 Feel free to drop support a line if you run into issues! It's great to see Community being used this much btw - Thank you for your contributions!